Shimmering "Diamonds by the Yard" are available in Atlanta at The Ross Jewelry Company. Diamonds by the Yard | The Ross Jewelry Company in Atlanta offers a wide selection of "Diamonds by the Yard". Diamonds by the Yard in Atlanta | To see a selection of "Diamonds by the Yard" . . . please follow the link below. And . . . please note that, due to fluctuating gold prices, pricing will change. So, please call for a current quote on any item you like. Please do not hesitate to contact us with any question about this collection. 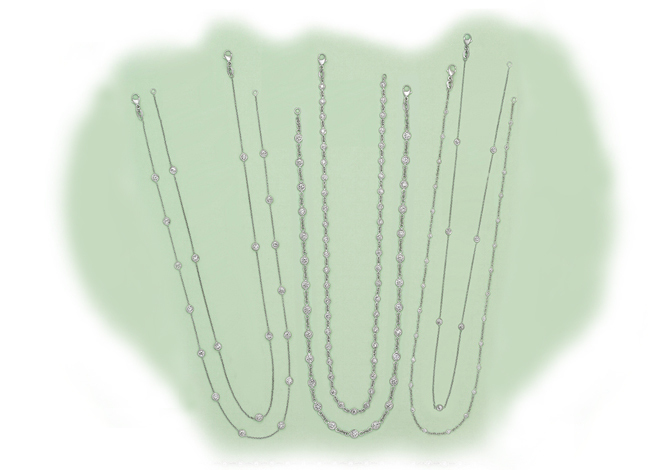 If you have a question about a specific necklace, please note the Style Number and Page Number where you find the item.